£100 deposit to confirm holiday. Balance to be paid 6 weeks prior to holiday. Some Monday to Monday letting. Please ask. Please note, passes are not included in pricing. 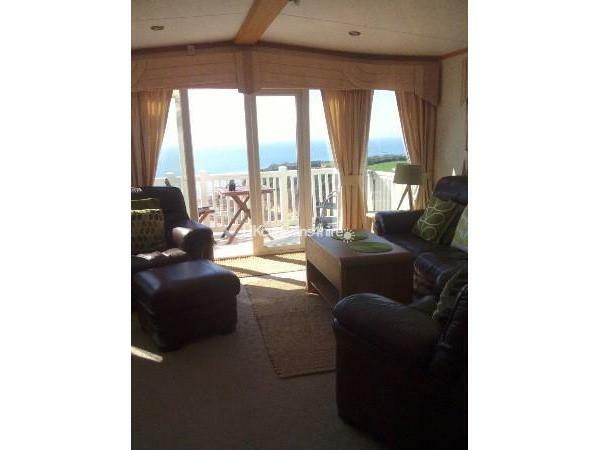 Static Caravan for rent on Devon Cliffs. Just enjoy sitting on the full length verandah and enjoy the scenic views. Couldn't be better. 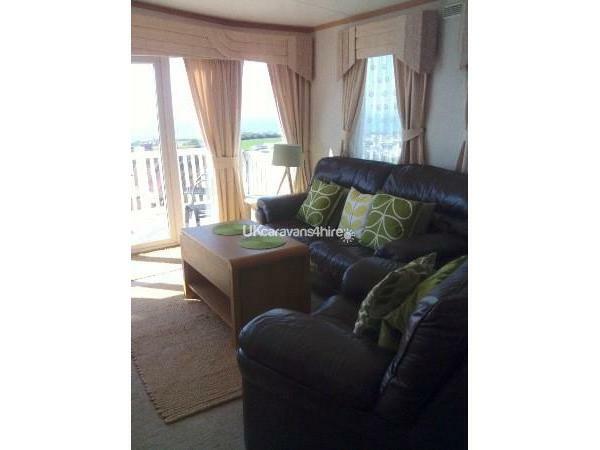 The French doors from the caravan lead out to the balcony. 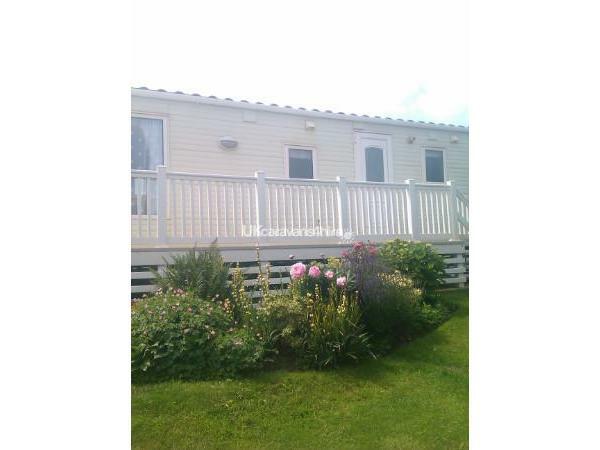 The caravan has its own secluded gated garden( making it safe for children) with a shed for all the garden furniture. 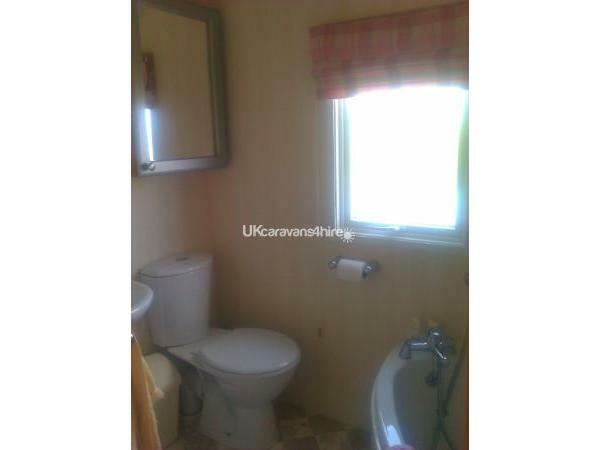 Double room has en-suite shower room, 2nd bathroom has corner bath. 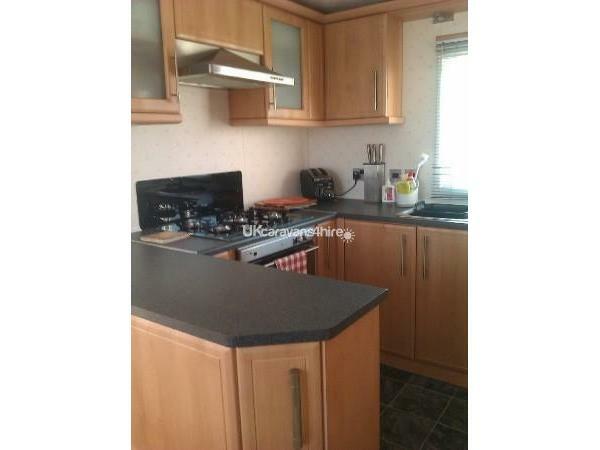 (Just what the children want) The Kitchen has full size cooker, fridge/freezer, washing machine, with all the modern facilities. The Dining area that you can view the cliffs and Budleigh Salterton. There is a roomy lounge area, with leather sofa, 2 comfy armchairs. 32" LCD TV.The decking has a lockable gate, making it safer for the children. Also the side gate to the pitch has a lock from the inside. 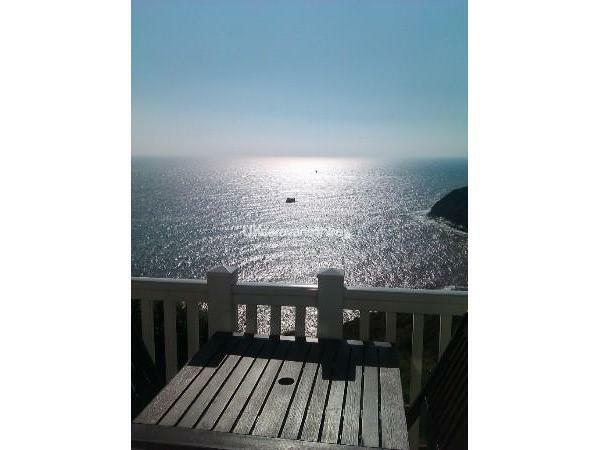 Relax in the secluded garden, or on the balcony for the panoramic sea views. Spectacular!! Countryside and the sea!! Beds are made upon your arrival, making it hassle free. (Goose feather duvets are provided). Both bedrooms are double beds. 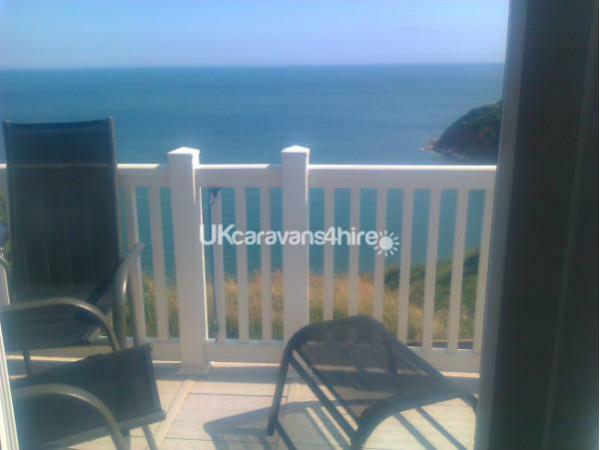 What a fabulous caravan with a stunning sea view. Everything you might need is provided and the added extras in the caravan were very much appreciated. Sylvia was a joy to deal with and nothing was too much trouble for her. 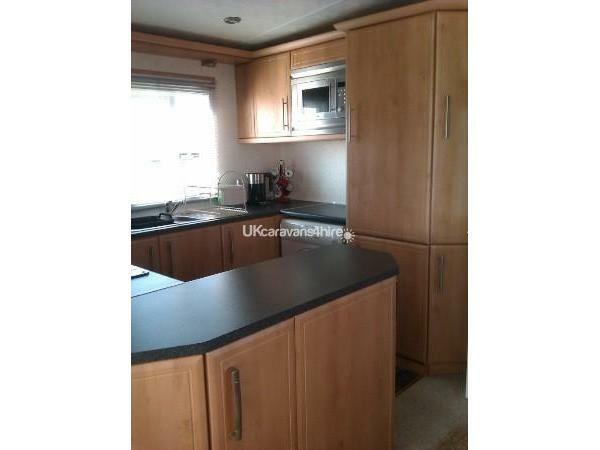 I would certainly recommend this caravan to everyone as you won't be disappointed. I would certainly book again in the future. A fantastic caravan on a fantastic site. 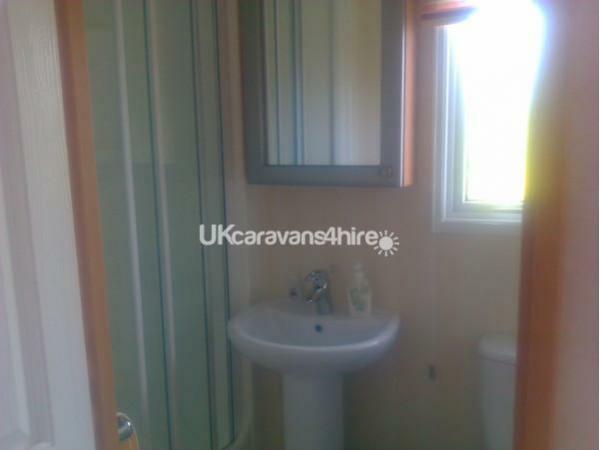 The caravan was wonderful, spotlessly clean and had everything we needed to make our holiday even more special. Amazing views, enclosed garden was great for the kids too. A lovely, quiet setting with all the site entertainment not far away. Thank you, definitely would recommend this to everyone! What a lovely caravan! Superbly presented and looked after, with quality furniture and furnishings, very thoughtfully put together to make guests feel extremely comfortable (I don't think our house is as well furnished as this). Amazing sea views from the balcony, and a lovely fenced garden for our two little girls to play in. None of us wanted to go home! Thank you so much, Sylvia, for a very pleasant weekend. This really is the best pitch on the site. In a quiet location with views of both Exmouth and Budleigh and overlooking the coastline. With a private garden which is 100% safe for young children you could not ask for anything more. The caravan is well equipped and even had plastic plates and cups for my younger daughter which was ideal. 2 toilets was a plus and the bath was ideal for sorting the kids. We had a fantastic stay and would definitely go back. Sylvia was extremely attentive to our needs even leaving us an Easter card which was a lovely touch. All round a great holiday! After many years of renting mobile homes for short holidays, this is absolutely the best we have ever stayed in. Starting with the quality of the vehicle itself, to the presentation and thought given by the owner and her attention to the smallest detail. Nothing was lacking in comfort and the quality of furnishings could not be bettered. The site itself is the best on the park if you want quiet and stunning views, the totally sheltered garden is another bonus. It is truly not possible to fault the van, contents and view in any way and we cannot recommend it too highly. Thank you Sylvia for all your consideration and quality. We hope to return later in the year. Wonderful caravan, real home from home. Most amazing location, the best view in the world in a very quiet corner of the site. 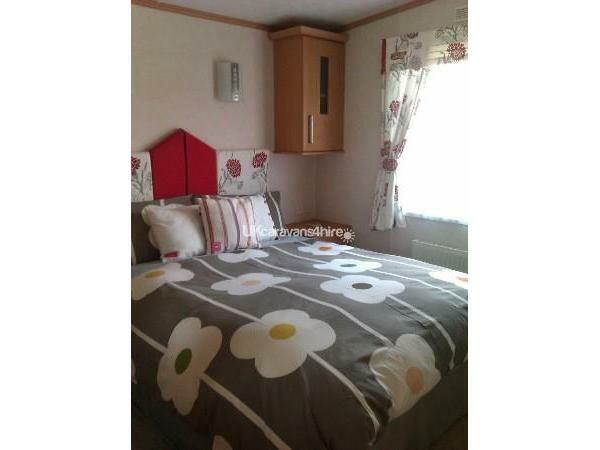 Perfect as you have all the peace and quiet you could desire whilst being on a site that provides every facility and entertainment you or your family could wish for! Everything you could possibly need is provided by a very attentive and caring owner, couldn't recommend too highly.